Basketball training needs to be carefully designed based the movement patterns that exist within the game. This understanding allows players to train using dynamic movements that promote function. For example; an exercise that includes a movement application is favored over one that is stationary. In addition, movement training primarily increases a human beings capacity for functional strength and conditioning. At Larry Hughes Basketball Academy, we provide Basketball Training St Louis, MO to plant the perfect drills and skills sessions. If you are among them who takes a keen interest in the basketball game, then you surely must know how important to do the basketball training on a regular basis, even when you don’t want to do it. It is similar to learning how to play the piano or guitar where you must constantly practice and you must do the same in basketball if you hope to improve your game playing skills. Carefully planning drills is very important, however, and you must plan them according to the individual team members and the team and where they most need improvement. Larry Hughes makes a crucial step and plants the perfect drills and skills sessions to his Youth Basketball Teams St Louis, MO. To enhance your gaming skills, it is imperative to change training drills in a regular time period. Doing the same drills during every Basketball training session is not only boring for players; it ends up limiting the progress they make. To lessen this problem Larry Hughes provide basketball training in which every drill focuses on a different skill and sometimes different aspects of the same skill, so it's always a good idea to have a good variety of them at hand. Variety keeps players interested in what they're doing, and more motivated, and it will give them the chance to improve their skills drastically. Of course, it's also good to practice the same drill long enough so that the practice sinks in, but then a change can be refreshing for everybody. Basketball training session needs to focus on various aspects of the game, and a great example of this is learning how to shoot. Players aren't likely to get bored practicing how to shoot because that's how they score in the game and so shooting is one of the primary aspects of the entire game. Shooting fouls are one drill they should focus on, but they also need to work on shooting from all different positions, and also while being guarded. The best shooters in the game of basketball are the ones who can shoot and score at a moment's notice from anywhere on the basketball court. Basketball drills need to focus on this specific skill. In short, not only will training help you develop important basketball skills, but it will also bring the entire team together. 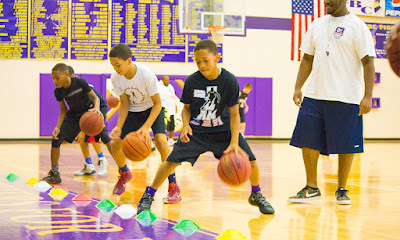 The more drills players do, the better basketball players they'll be, and the more they'll be able to run, shoot and dribble. So make sure you remember all this when you are planning your basketball training session.